Last night Drew and I took our good friend Vitaly to dinner at El Ideas. This was a horribly late Christmas/Birthday gift but well worth the wait! 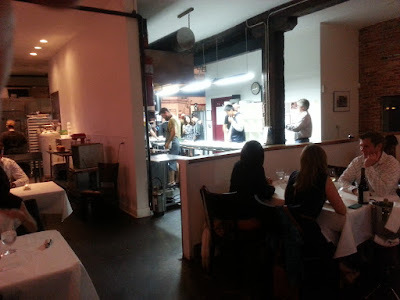 I loved the layout of the place, the kitchen was open to the dining room and there were only about 10 tables in the place. 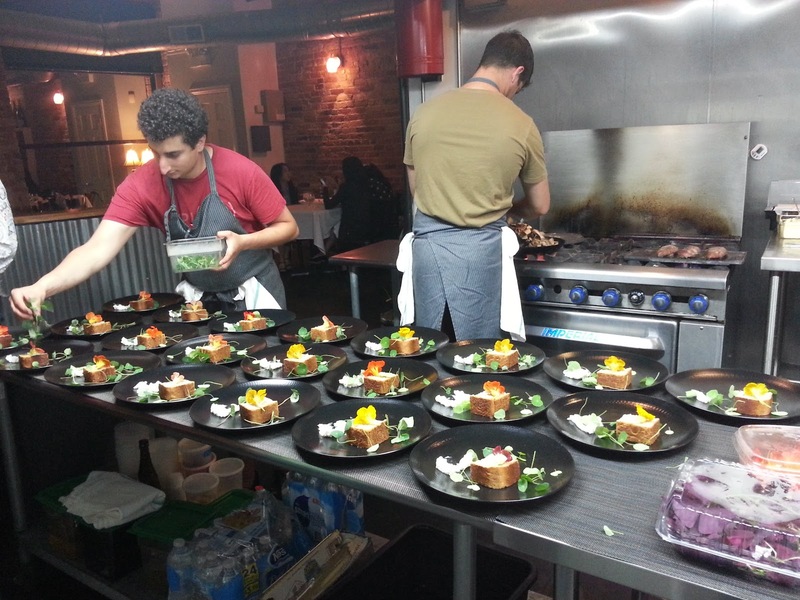 Chef Phillip Foss explained the idea was to have a more casual almost supper club feel to the evening. We were even told we are free to hang out around the kitchen and check out the action! I took a few shots of some of the dishes, especially the ones that stood out to me quite a bit. 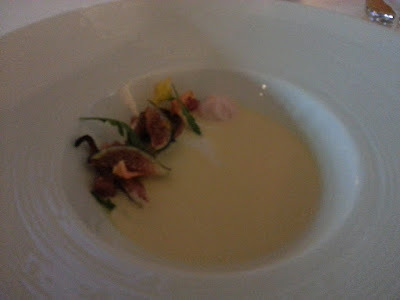 This soup was the ajo blanco which was an almond and garlic soup with ham, figs, grilled octopus and melon. The flavor of this was amazing, I think this one was one of the first that really blew me away. 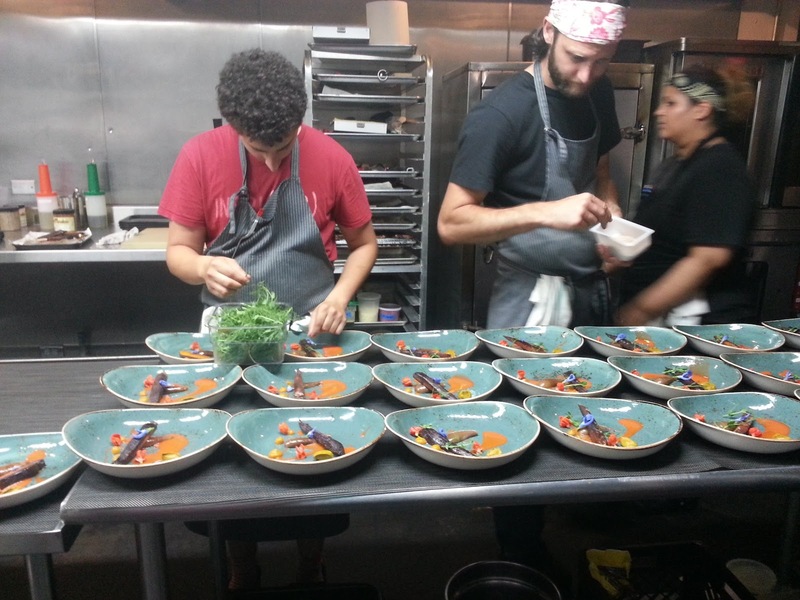 We ventured over to the kitchen for a bit to see the chefs at work. Here they are putting the final touches on a carrot dish that was served with eggplant. 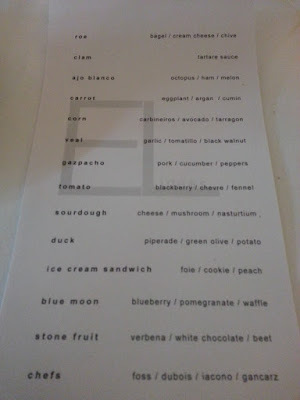 It was very interesting to see the detail that goes into each dish. 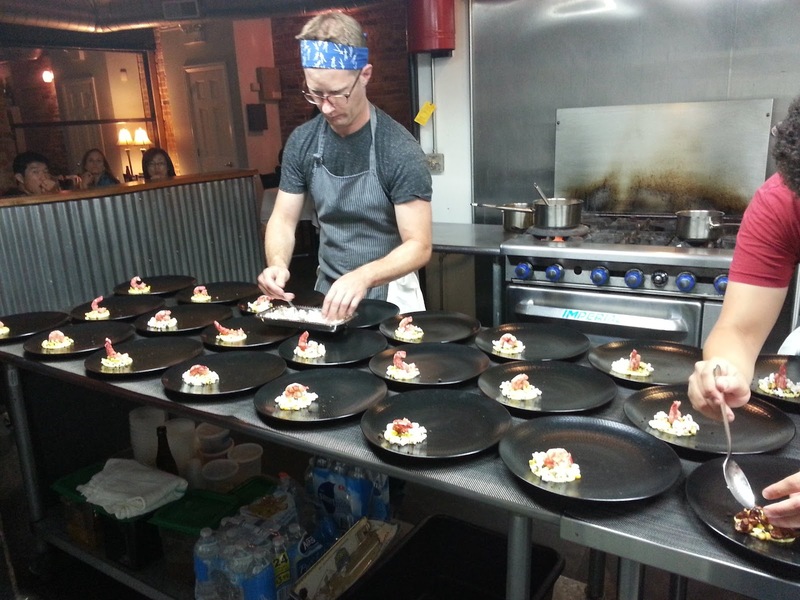 Here Chef Foss is at work in the kitchen putting the final touches on a corn focused dish. It was very inspirational to get to see chefs at work in the kitchen, I was glad to get to be involved in their process and to see it all come together. The photo of the dish came out a bit blurry but it is made up of corn puree, dehydrated corn, popcorn, huitlacoche and an avocado puree. On top is a Spanish prawn. 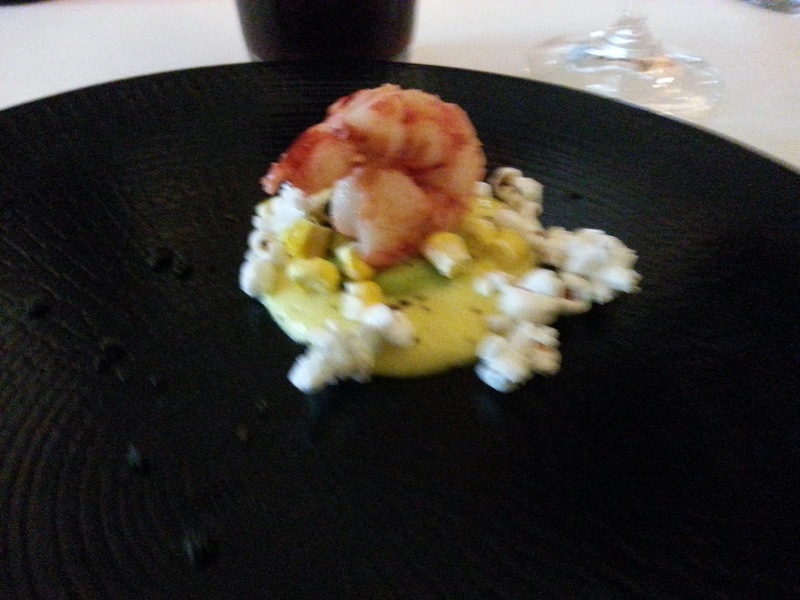 This dish completely blew me a way and was probably my favorite of the night, but I also am a huge fan of corn. The chefs putting the finishing touches on another favorite dish: homemade sourdough bread with cheddar butter and lardo. 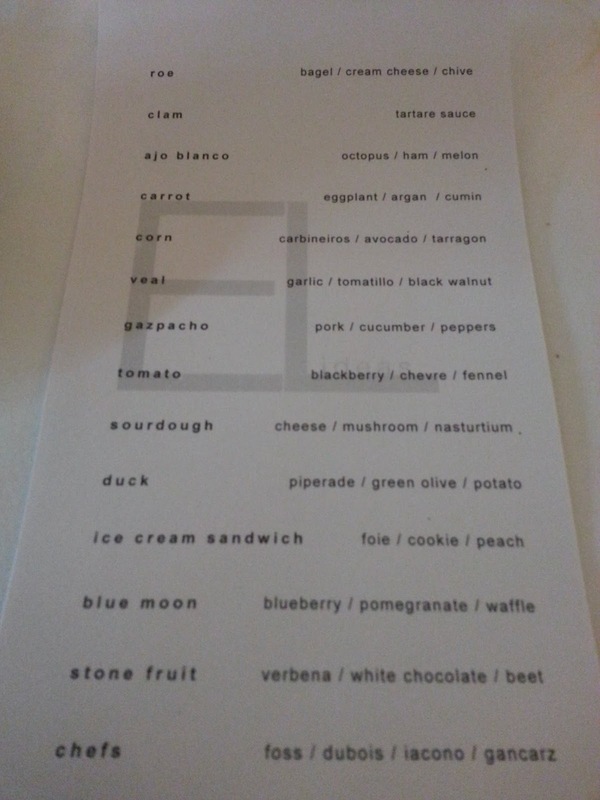 I have not had lardo very often but it turned out to be one of my favorite single components of the evening. The flavor was just right and it was creamy without being too greasy with a slight onion or garlic flavor. This was a duck course with sous vide breast that was then grilled. Under it is some confited duck. This is all on top of a potato and olive oil emulsion and green olive puree. This was foie gras ice cream sandwich sandwiched inside of a cookie with spiced peach bourbon jam. I enjoyed the dish very much. 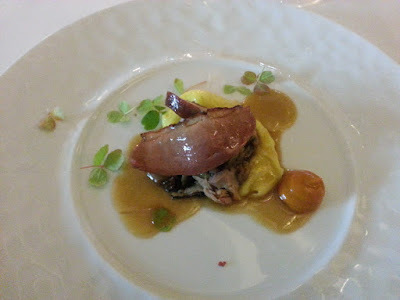 The foie gras was great in this form and went really well with the jam. This is the point in our meal where we opened up a bottle of 2012 Dark Lord and we found that it paired really well with this dish. We poured ourselves a bit and decided to share the rest with the kitchen crew. 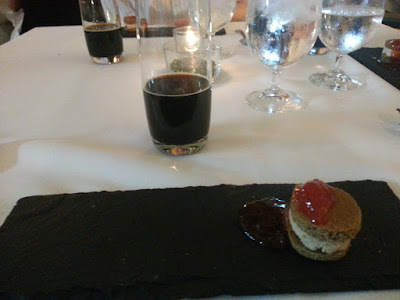 This was probably one of my favorite desserts. 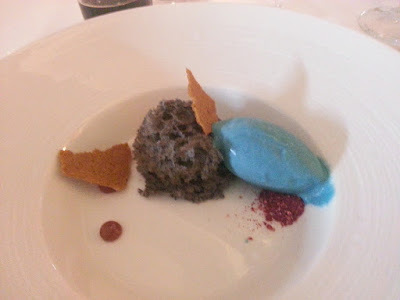 It was Blue Moon ice cream with blueberry angel food cake, dehydrated pomegranate, pomegranate puree and waffle chips. Overall I had an excellent time at the restaurant. The atmosphere was very laid back, Chef Foss and his crew were more than welcoming and the food was really well done. This is something I'm definitely spreading the word about and can't wait to go back again to experience it again.